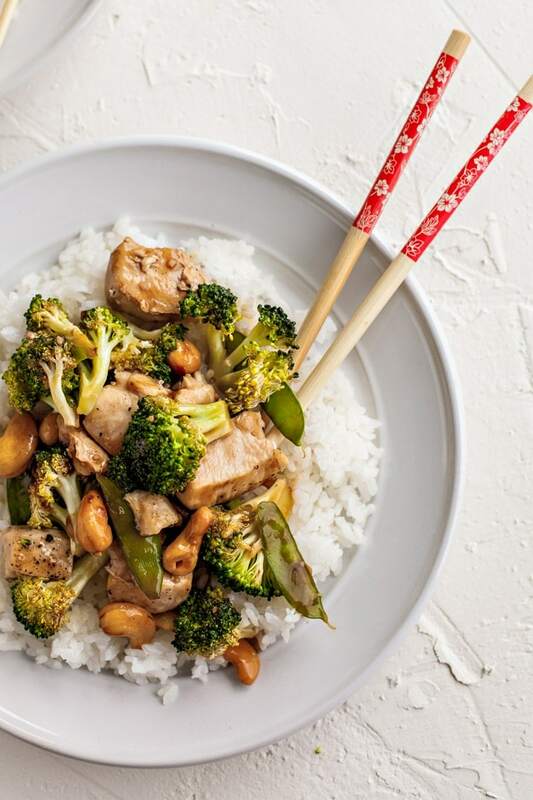 Cashew Chicken and Broccoli is a quick and easy dinner that everyone will love! Baked in the oven with a sweet and savory sauce, it’s ready in less than 20 minutes! 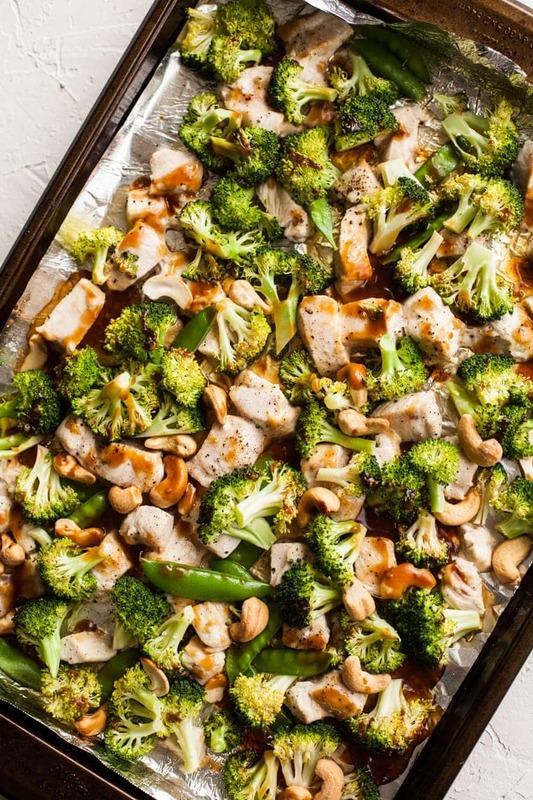 While this tasty dinner may look like stir-fry, it is actually made on a sheet pan and baked in the oven. That means you don’t need to stand by your stove and stir OR fry! I love how easy this dinner is to whip up, and my whole family loved it! The ingredients for this dish are pretty simple. Hoisin sauce is a special Asian sauce that you can find in most grocery stores. It’s mostly a mixture of soy sauce, sugar, and garlic. If you don’t have it or can’t find it at the store, it’s o.k. to leave it out of the sauce. First, you’ll want to prep a large cookie sheet by covering it with foil or parchment paper. Then lightly spray it with cooking spray. You’re going to cut your chicken into bite-sized pieces and spread them out on this tray. Sprinkle with salt and pepper. Then you’re going to pop these into the oven for just eight minutes. Meanwhile, you’re going to chop a head of broccoli and prepare any other vegetables you’d like to add. Great possibilities are onions, bell peppers, asparagus, and snow peas. 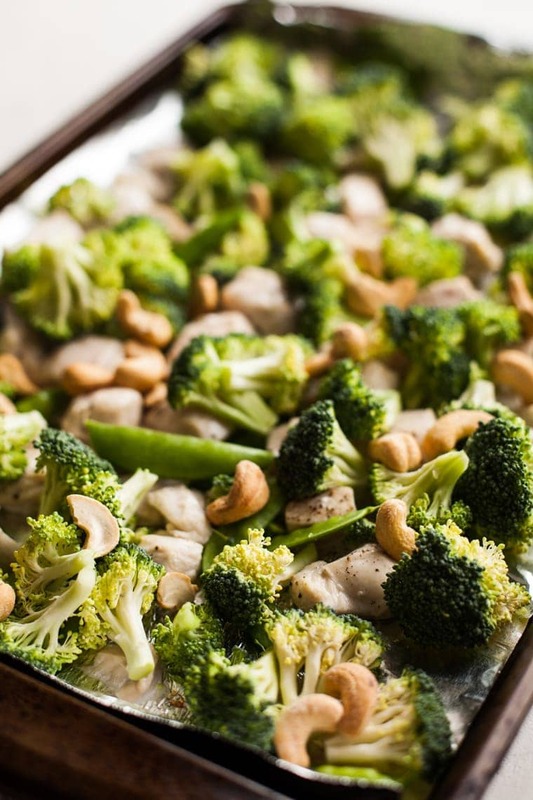 After the eight minutes are up, take the chicken out and add your veggies and cashews. Then drizzle your prepared sauce over the top. You may not use all of it. That’s o.k. I like to save some to add at the end or to pour over the top when I’m serving this with rice. 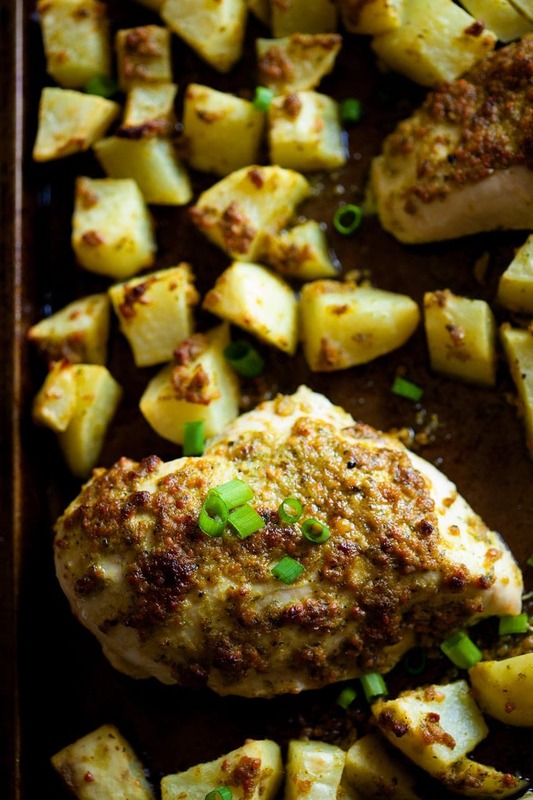 Then you just bake this for another 8-10 minutes, and you have dinner perfection! When this is done baking, I transfer it to a bowl, add more sauce if necessary, and spoon it over the top of Japanese sticky rice. This would also go great with Jasmine rice or brown rice. Add this to your dinner menu this week. You’ll be so glad you did! 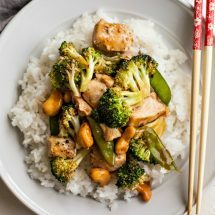 Ready some more Asian inspired recipes? 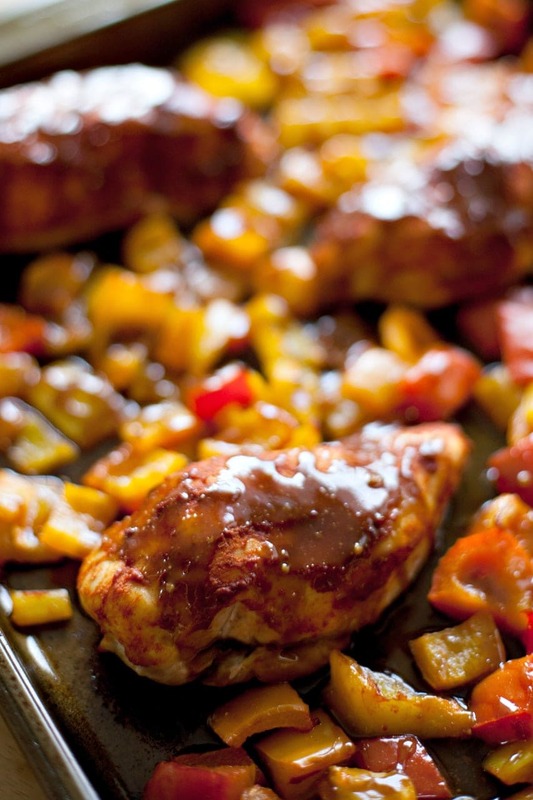 How about some sheet pan chicken recipes? 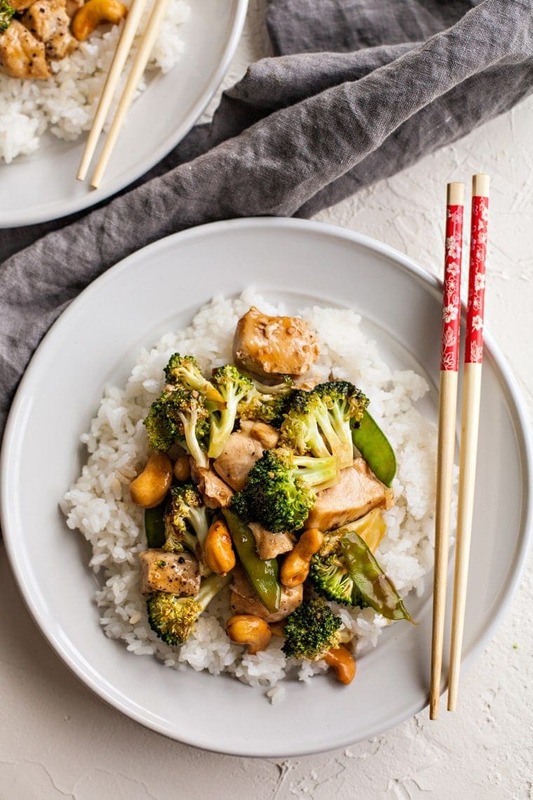 Cashew Chicken and Broccoli is a quick and easy dinner that everyone will love! Baked in the oven with a sweet and savory sauce, it's ready in less than 20 minutes! In a small saucepan on the stove over medium heat, add the soy sauce, hoisin sauce, apple cider vinegar, honey, sesame oil, ginger, and garlic. Stir and heat until almost boiling. Meanwhile, stir the cornstarch with the 1/2 cup of water and set aside. When the rest of the sauce mixture is hot, pour in the cornstarch/water mixture, stirring constantly as you pour it in. Continue stirring sauce over medium heat until it thickens slightly. Remove it from the heat and set aside while you prep the chicken and vegetables. 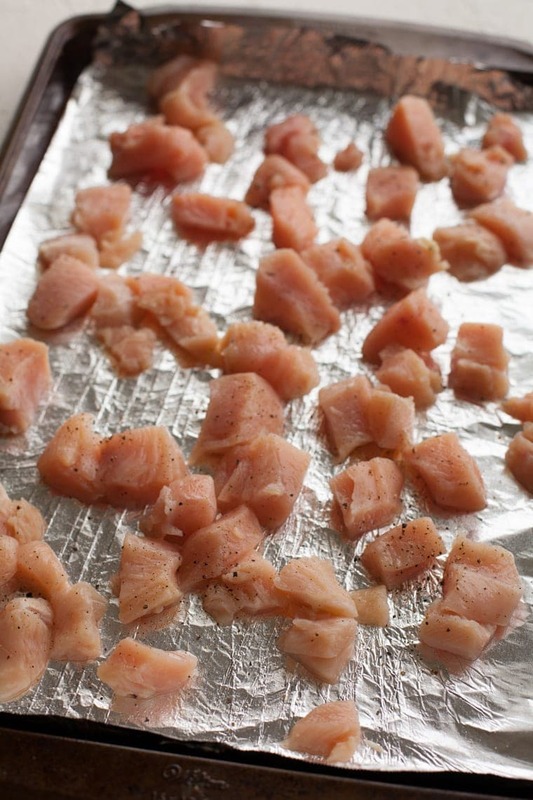 Line a large cookie sheet with aluminum foil or parchment paper and lightly spray with cooking spray. Add the chicken pieces to the baking sheet and sprinkle with salt and pepper. Put in the oven for eight minutes. 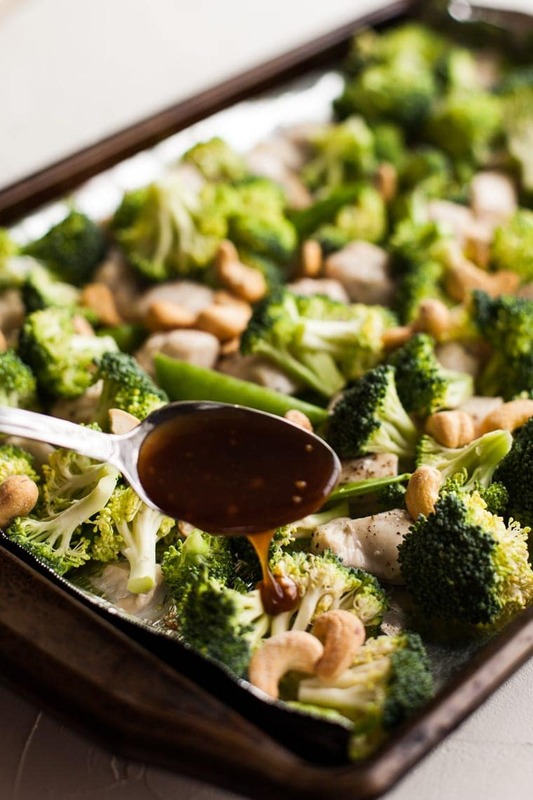 Then remove from the oven and add your vegetables and cashews. Drizzle with the reserved sauce. You may not use all of the sauce. Return to the oven for 8-10 minutes, until chicken is cooked through and juices run clear. Serve over rice or noodles and additional sauce if desired. For more easy dinners made on a sheet pan, try these! Melissa loves inventing new ice cream flavors and helping people declutter and organize their homes. You can see her organizing e-course HERE.